The truth is, your bookkeeper doesn’t necessarily need to see your receipts but the IRS does. The IRS requires documentation that proves those transactions and amounts were tied to valid business expenses. Who has time for that? You do, because it doesn’t take much time at all, and your bookkeeper can help. You want to be ready for an IRS audit. Here are a few tips for saving receipts and documentation that will stand up to an IRS audit and give you peace of mind. Make a habit of writing the name or purpose of your expense while at the checkout line, in the restaurant, etc. Keep receipts for cash transactions. As you know, cash transactions can cause further scrutiny. “Impossible to track” means “Impossible to cover your tracks.” Keep the receipt. Credit card statements and bank statements are only the last chapter of the story. Help yourself out by telling the story along the way on your receipts. Hold it, stuff it, file it…somewhere, anywhere. Just keep the receipt. I throw all of mine into a file or basket. Some clients have an envelope. You don’t need to keep them in any special order, you just need to keep them. 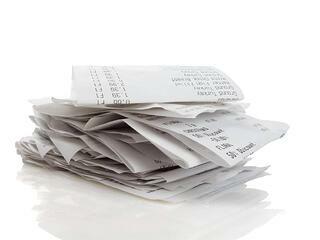 At the end of the year, file your receipts with bank statements and other important financial information. Save a picture of the receipt on your cell phone. Or, better yet, save the receipt in your calendar invite for the meeting or travel-related expense. Like your paper? Keep a file in your car and make a weekly task to scan, save and upload receipts to QuickBooks. And make sure to get PDF receipts emailed to you. Then simply upload the files into QuickBooks for easier recording and saving. Where should I keep my receipts, and in what format? As soft copies in a file on your computer, Dropbox account, etc. QuickBooks Desktop: In QuickBooks, enter a credit card or check. Select the paper clip icon on the SmartVault toolbar to upload the receipt. QuickBooks Online: Go to the gear icon at the top right, then navigate to Lists and then Attachments. Or you can attach to each transaction using the paper clip icon at the bottom left. Note: All files in the attachments directory are stored, scanned and locked. You can find any of your attached documents here and search them by name. QuickBooks actually makes a copy of the attachment and marks it as read-only. In short, yes—you need to keep your receipts. It’s not hard to do, so don’t chance it. Make keeping receipts a habit, and consider the practice an investment in growing your business. Help yourself by taking a couple extra seconds to take a few notes or make a few clicks to tell your expense story. And taking these easy extra steps will only help your bookkeeping and CPA partners better legitimize your story in your financial statements. Need help sorting through your expenses, classifying them or determining if you are profitable? We can help! I’m Kathy Dise from BudgetEase, and I’m here to make YOU profitable. You can reach me at kathy@budgetease.biz.